1. Drag video file from the File Folder and drop into the preview window, or click <Open> button to load video file. 2. (Optional) If you want to select the video clip to mix with audio data, just drag the top slider to set the start point and drag the bottom slider to set the end point. Click <Cut Video> button to cut video clip, click <Cut Audio> button to cut audio clip, click <Cut Mute Video> button to cut video without audio. 3. Drag audio file from the File Folder and drop into the preview window, or click <Open> button to load audio file. 4. (Optional) If you want to select the audio clip to mix with video data, just drag the top slider to set the start point and drag the bottom slider to set the end point. Click the <Delete> <Copy> <Cut> <Paste> <Paste Mix> button to edit audio data and click the <Undo/Redo> button to control the process. Click the <Amplify+-> button to adjust the volume of selection. 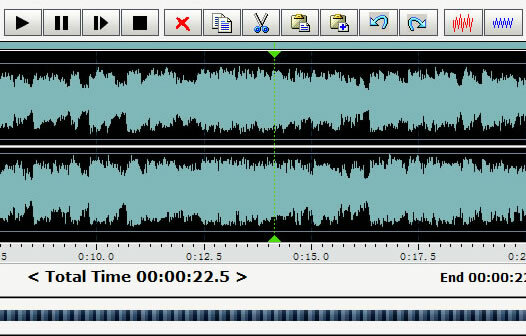 Click <Cut Audio> button to cut audio clip. 6. Click <Mix> button to begin mixing.